HotForex Upcoming July 2017 Webinars! Instructor: Andria Pichidi, HotForex’s Analyst. HotForex Upcoming August 2017 Webinars! In this lively interactive session with our Market Analyst you will learn how interconnected the financial markets are and why the FX market is so important. Today we will look at an intraday strategy that focuses purely on the price action of the shorter time frames. We will explore the most appropriate indicators and the timeless power of support and resistance. Senior trader and forex researcher, Kay, looks at Price Action vs. Mean Reversion, the two types of currency trading strategies, and explains how they can be combined efficiently. Bitcoin is the unique and popular digital currency that is quickly changing the financial world. We added it as a deposit option earlier this year, and now we’re thrilled to announce that it is also our newest CFD, available for buying and selling! Don’t miss out on this exciting new instrument, and be sure to attend our LIVE Bitcoin webinar on August 31 to get all your questions answered! If you need any help in the meantime, get in touch with our support team who will be happy to help you. 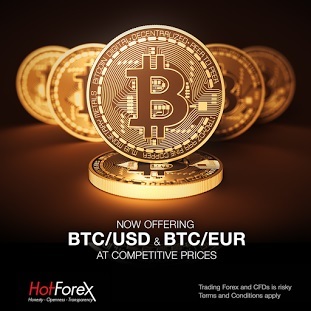 Update: Bitcoin trading in NOT available to HotForex clients whose account(s) falls under HF Markets Europe Ltd.
HotForex: Upcoming August 2017 Webinars Part-2. HotForex Officially Sponsors Porsche Driver Tio Ellinas! We are proud to announce that HotForex is sponsoring racing champion Tio Ellinas, for the third time, as he competes with the JTR team at Porsche Carrera Cup Great Britain. To find out more on the sponsorship and exclusive pictures featuring Tio Ellinas, click here. The HotForex VIP Contest returns for another year to offer you the chance to meet your broker in Cyprus and receive rewards and more! HotForex: Upcoming October 2017 Webinars Part 1. HotForex is proud to present its latest tool, Autochartist! This MT4 market scanner is here to revolutionize your trading by working 24 hours a day so you don’t have to worry about any more missed opportunities. To read complete information on each tool’s features, to watch the relevant video or to download detailed user guides, click here. Brand new MT5 platforms now available! As part of our mission to ensure that we constantly offer our clients the best tools for the ideal trading experience, we have now added the popular MT5 platform for desktop, web, Android and iOS devices!